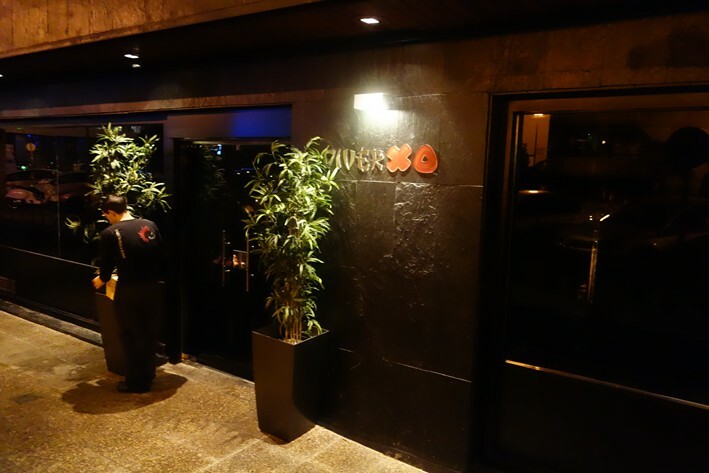 David Munoz’s restaurant opened in 2007 (it moved premises in 2009), and has had a stratospheric rise up the Michelin ranks. 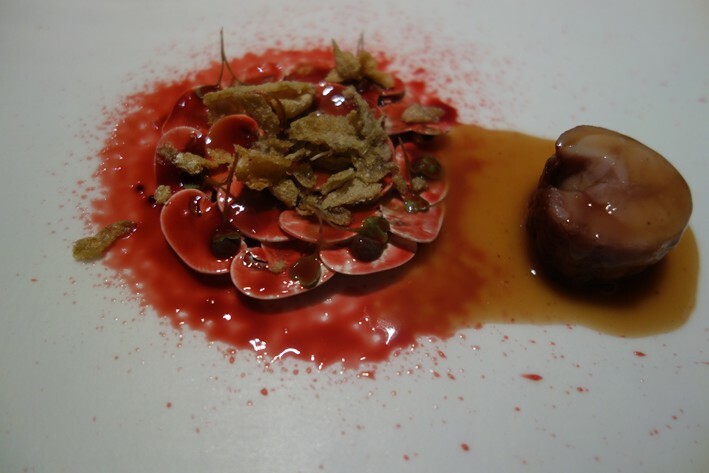 It was awarded its first Michelin star in 2010, its second in 2012 and the ultimate third star in the 2014 guide, the chef being just 34 years old at that time. After catering college Mr Munoz trained at Balzac and Viridiana in Spain before travelling and working in assorted restaurants including Hakkasan and Nobu in London. 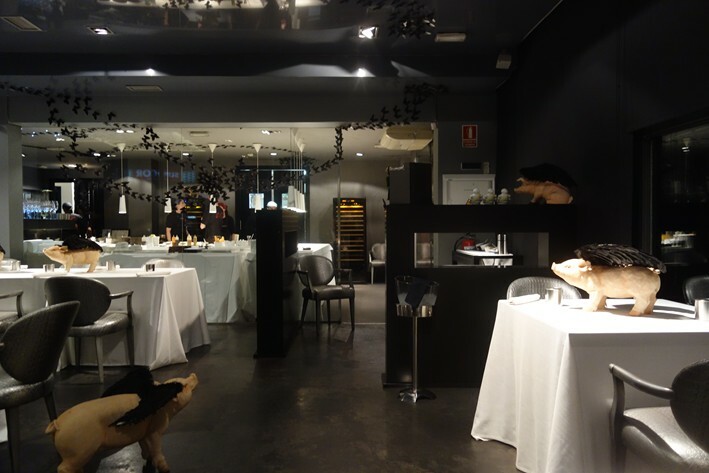 The restaurant is in a nondescript street in a residential area of Madrid. As you enter you go through what might be a bar area but is used by the staff as a dish assembly station, presumably due to space constraints in the kitchen. In fact the restaurant will move in summer 2014 to larger premises nearby. The dining room seats a couple of dozen or so diners, and has well-spaced tables with crisp white linen tablecloths. 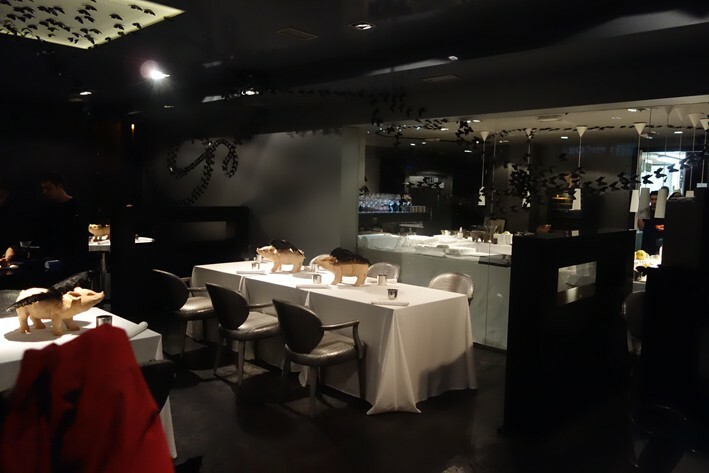 Ornamental flying pigs are placed on each table as you sit down, but are whisked away as the waiter describes the menu; perhaps these are to emphasize that the meal will not be conventional. There is no a la carte option here, just two tasting menus, the lengthier being eighteen courses. The chef, sporting a mohawk haircut, reputedly never misses a service at DiverXO, although he has a casual dining operation elsewhere in Madrid. Dishes do not appear on normal dinner plates, but are presented either on large slabs or on specially designed trays with recesses in them. Similarly there are no regular knives and forks set out, though suitable utensils for each course appear in a little box. The chef seems to like to mix up the usually static nature of dishes, with waiters often adding an extra element to a dish part way through eating. A one point a waitress appeared with a tomato sorbet that she placed, via a spoon, directly in my mouth, so this is not a restaurant that feels constrained by convention. The wine list did not focus entirely on Spain, and had wines from good growers around the world. Gaja Marcanda Promis 2010 was €36 for a wine that costs about that in a shop, Chapoutier Varonniers 2009 was €62 for a wine that retails at €50. Saxemburg Select 2002 was €86 and yet that wine, if you could actually find it, would be slightly more than that in a shop. For those wanting to splash out, there was Pingus 2009 at €1,400 for a wine that will set you back around €830. 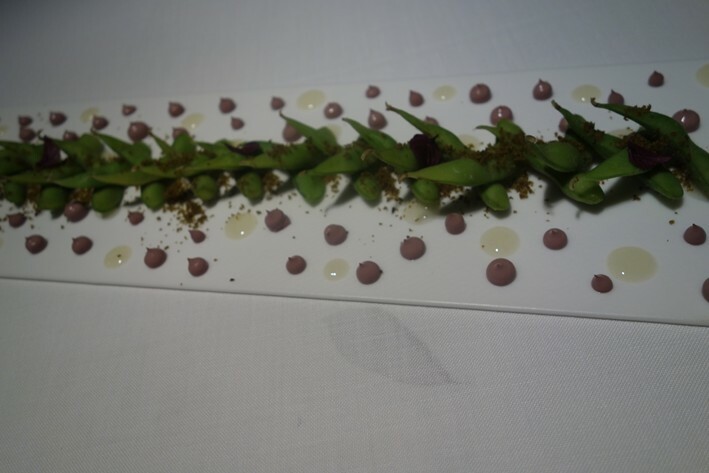 The meal began with a linear display of "Tokyo olives", actually edamame beans in their pods with Kalamata olives and little blobs of yuzu (Asian citrus) sauce alongside to accompany the beans. This was a simple but enjoyable beginning, the beans themselves very tender, the sauce enlivening the beans and having considerably flavour, its acidity working nicely with the vegetables (17/20). Coconut soup with scallops, clams, haricot beans and caviar was next, the scallop pieces tender and sweet, the coconut flavour present but not too strong. The stock had a real zing of citrus, the overall effect fresh, the flavours distinct and vibrant; it takes great skill to make a soup this interesting (20/20). 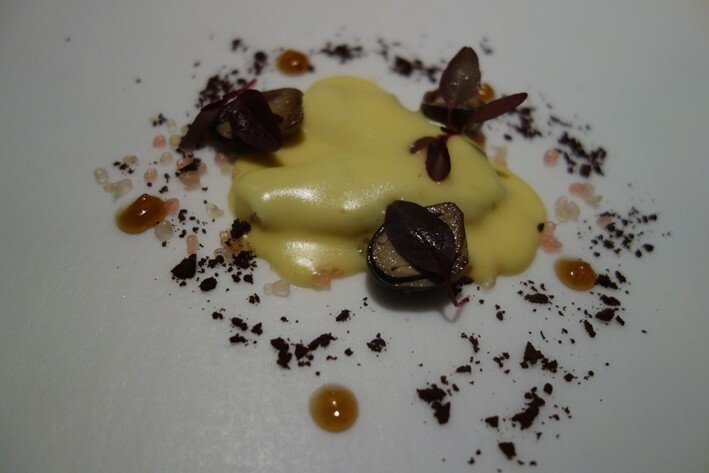 Alongside was a dish of sea urchin, pickled sweet and sour chilli, buffalo milk, celery and truffle. 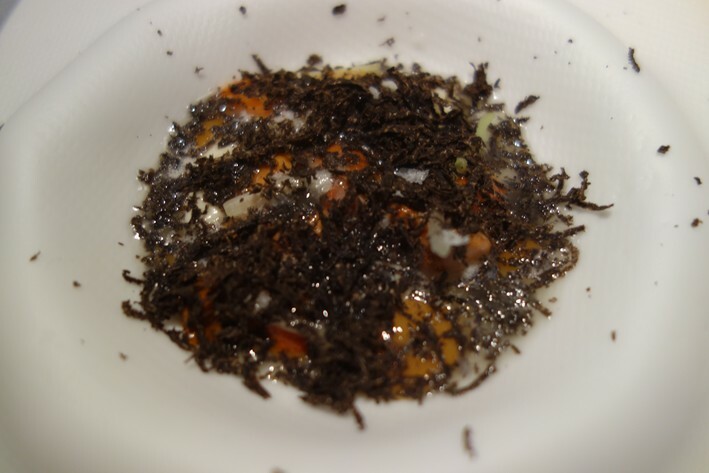 This sounds a weird combination but as a dish it worked remarkably well, the contrast of textures appealing, the contrast of the sea urchin with the earthiness of celery and truffle interesting, the dish lifted by the restrained use of the pickled chillies (19/20). 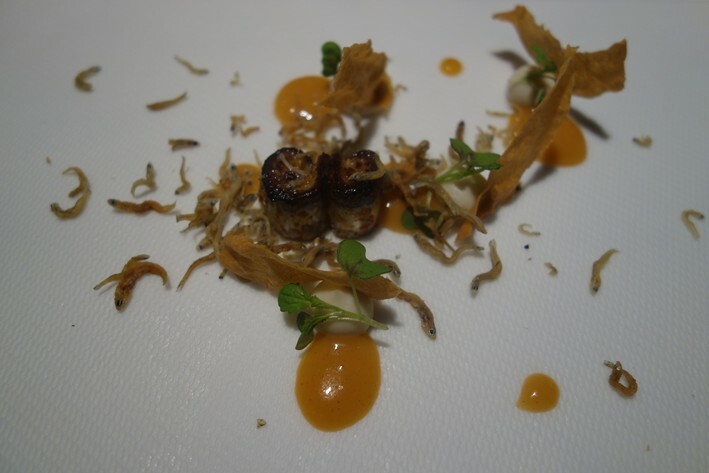 Coconut also appeared in the next dish, which comprised sardines with kimchi and beans. The sardines had superb flavour, the kimchi working really well to cut through the natural oiliness of the fish. I was very impressed with this, to be able to take a humble sardine and produce a dish from it with this much flavour while still being balanced (20/20). 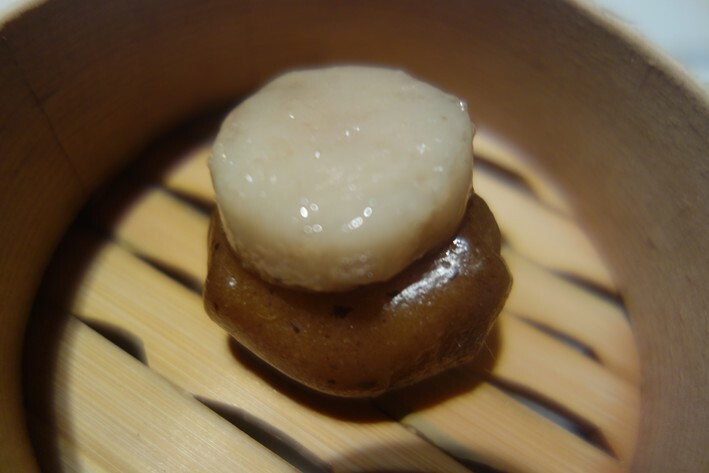 This was followed by hake “cococha” (chin) with water mushrooms, ponzu, finger lime, cacao and horseradish. Hake is a quintessentially Spanish thing to serve, but it can often have quite a dull flavour. 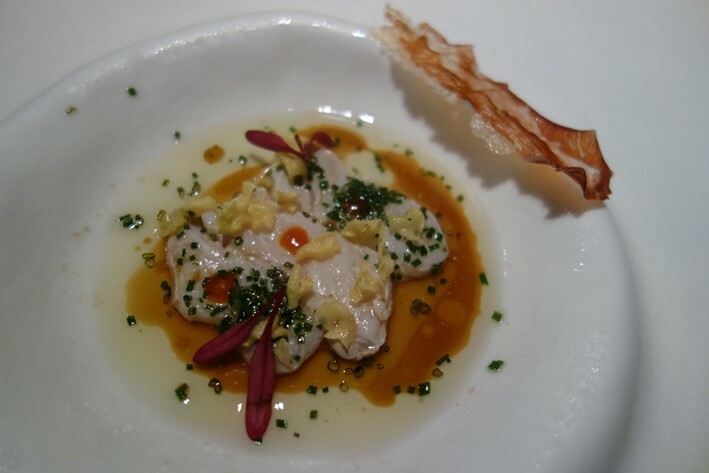 Here the fish was greatly enhanced by the bold flavours of the ponzu and horseradish, the lime providing freshness without being too sharp (19/20). Octopus stewed in cabbage juice, served with tiny carrots with lapsang souchon tea was next, with cabbage and a little croquette of kimchi, plus foam of carrot. 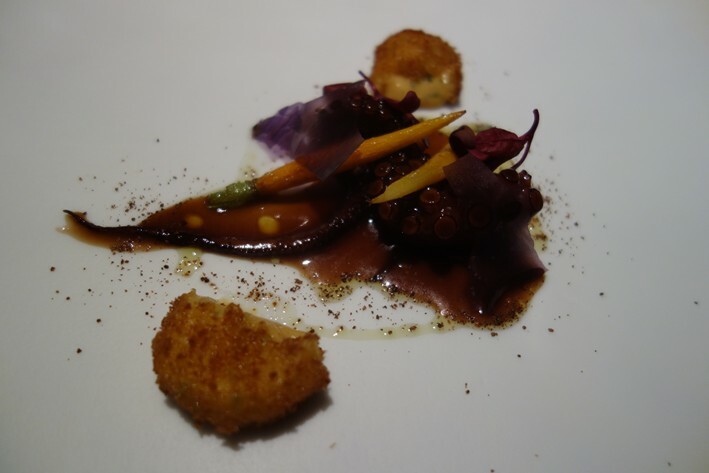 The flesh of the octopus was very tender (no mean feat in itself), the baby carrots having plenty of flavour, the croquette boldly spiced and working well with the seafood. What was striking here was the very bold flavours used, which could easily not work, and yet were actually very harmonious (20/20). 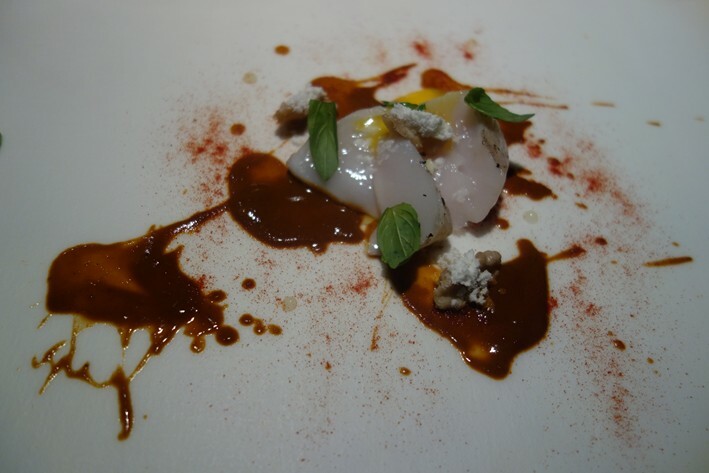 The chef's background in Asian kitchens was apparent with a dish of corn, a Chinese style "pot sticker" of liquefied carrot, tomatillo and tabasco ketchup, with an excellent skewer of deep-fried duck tongue with spicy bravas sauce added to the plate part way through us eating the dish. Again the humble ingredients were brought to life with vibrant flavours, the chef not afraid to give the bravas sauce a genuinely spicy kick (19/20). 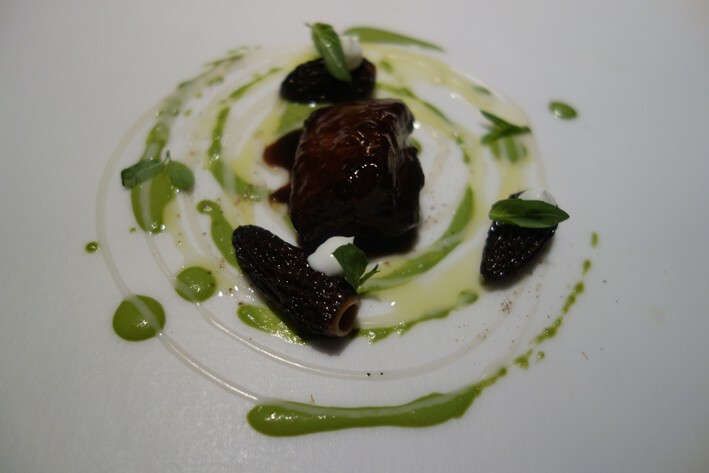 What looked like a piece of glazed pork cheek actually turned out to be tuna cheek, the fish nicely glazed with ginger, and the less plausible flavours of basil and Parmesan with a little black truffle. Again this had all the potential to be a train wreck of a dish, yet somehow the flavour combination held together, the tuna having excellent flavour (19/20). A last minute addition to the plate of a dim sum style dumping of Canary Islands potato and bone marrow did not, in this case, seem to add anything useful to the dish, and for me could safely have been dropped. A slightly playful dish followed, red prawns with white asparagus and Riesling sauce initially served as a tiny portion with tweezers to eat. 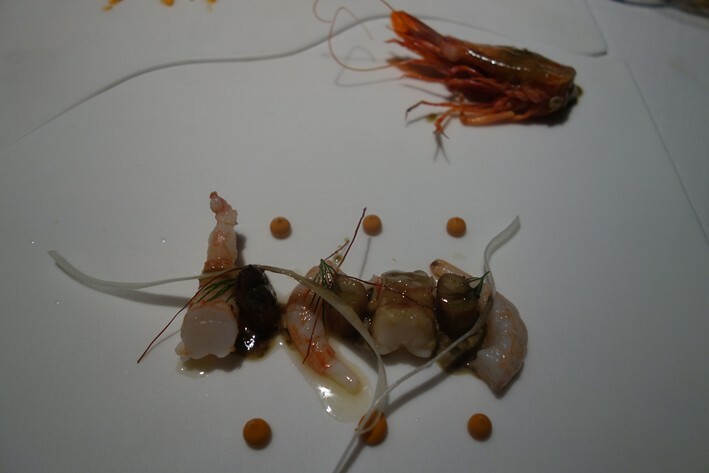 Once this was complete a larger sized version of the same dish appeared, this time with prawn heads as well. The prawns certainly had excellent flavour and the asparagus was a pleasant accompaniment, but I found this dish a little less exciting to eat than some of the others, good though it was (18/20). Next came langoustine and a strip of wagyu beef (from New Zealand) topped with a terrific herb dressing with fish sauce and sesame oil and bursting with flavour. Gordal olives, papaya and bone marrow completed the dish. The beef itself was very good rather then dazzling, but its dressing was superb. The langoustine was sweet and tender, though I wondered whether the combination of the delicate shellfish with the beef was necessarily a great idea, even though both components were excellent in themselves (18/20). Cod was next, served with hot mayonaisse, bacon, spider crab and red chilli. This was terrific, the bold spicing really lifting the dish. Cod can be a very dull fish, but here not only was it unusually good in itself, but the flavours of the bacon and mayonaisse and the spicy kick of chilli worked really well. An excellent nibble of soft shell crab was added to the plate, as seems to be the style here, when we were part way through eating the cod (20/20). 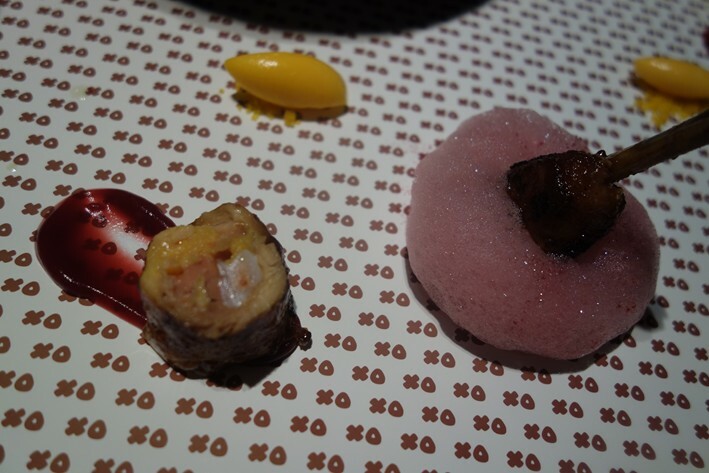 The next element of the meal was a little eel, pickled rabbit and Iberico ham sandwich, with smoked eel, chilli, eel skin and red hibiscus, the bun flavoured with, of all things, orange and hare. This had magnificent flavour, the eel gorgeous, the meat stunning and the spiciness carefully controlled – a really delightful dish (20/20). 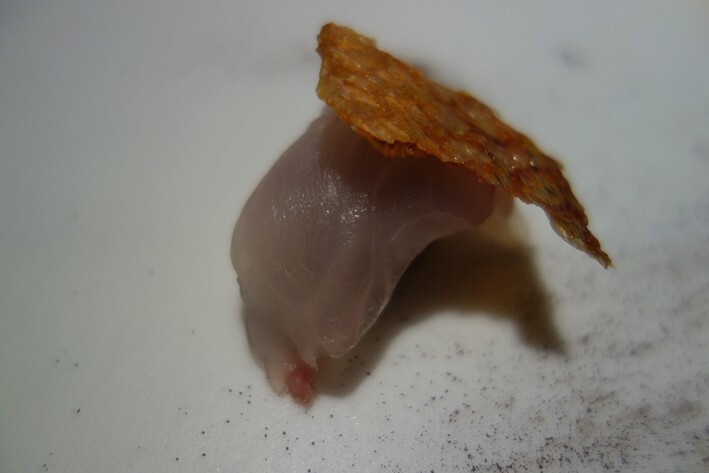 This was followed by wok-fried sole with yoghurt and bottarga, red mullet liver and roe sauce, with a piece of porcini mushroom on one side. The fish in itself was excellent, as was the mushroom, but for me the bottarga was too dominant a flavour, a rare case in this meal where the flavours did not seem perfectly balanced (16/20). 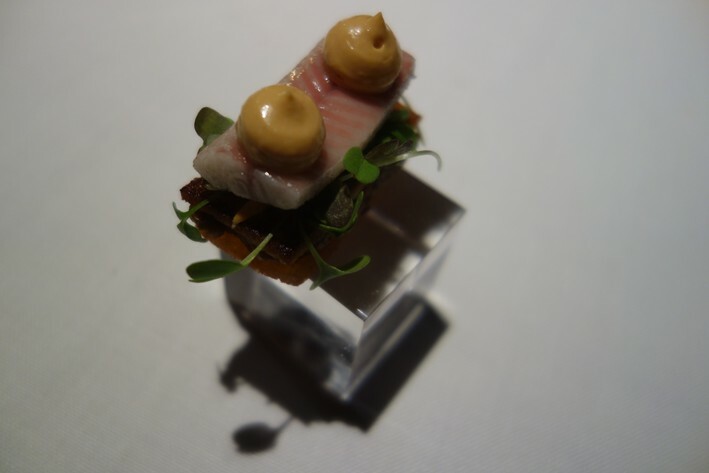 Red mullet with black garlic and potato was next, described as "causushi" (a Peruvian dish) with potato taking the place of the rice. That seemed a stretch as a description, but the dish itself was excellent, the fish having lovely flavour and the potato delicate (19/20). Hake made a further appearance, in this case with nuts and red curry, with egg yolk poured over the dish at the last moment. On the side was a brioche cooked over an open fire. This was a very comforting dish, the texture of the nuts usefully contrasting with the soft hake, the carefully controlled spices again lifting the dish (18/20). 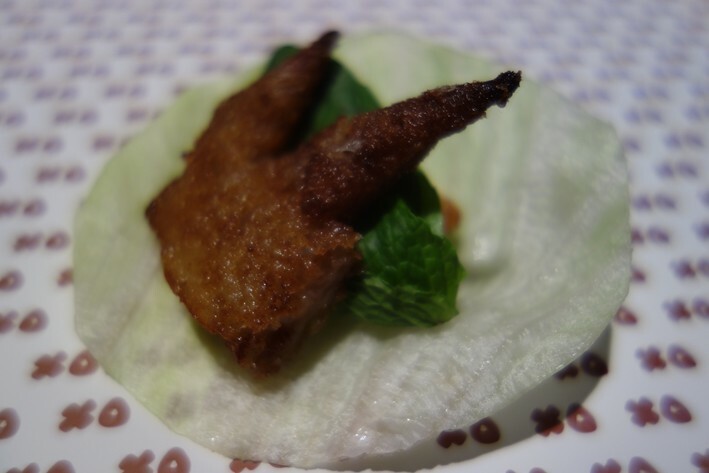 Chicken wing appeared on a lettuce leaf with a Mojito broth, with pickled chicken to one side, with chicken and miso croquette, rhubarb foam and egg ice cream. The flavour of the meat was excellent, the sourness of the pickle enlivening what could otherwise be a slightly bland dish, the chicken and egg motif an amusing touch (19/20). Pineapple salad had a little sauce of chlorophyll and olive oil, along with herb salad flavoured with anise, but the dominant flavour was fortunately the tropical fruit (17/20). 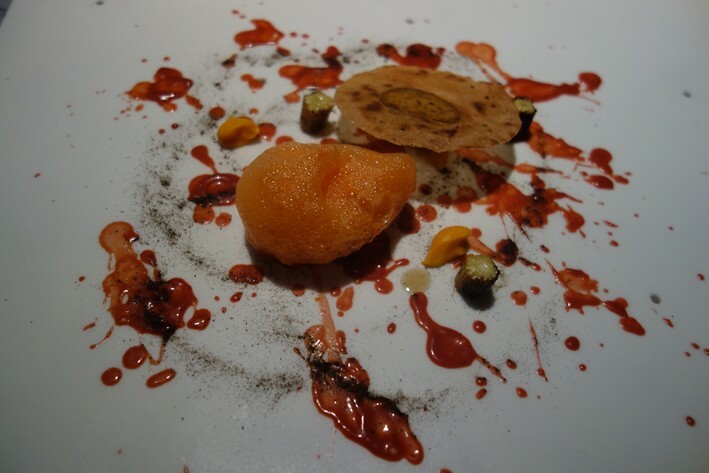 This was followed by wild strawberries and white chocolate with sweet and sour chilli sauce, a combination that tasted better than it sounds; the strawberries were certainly of high quality (17/20).. 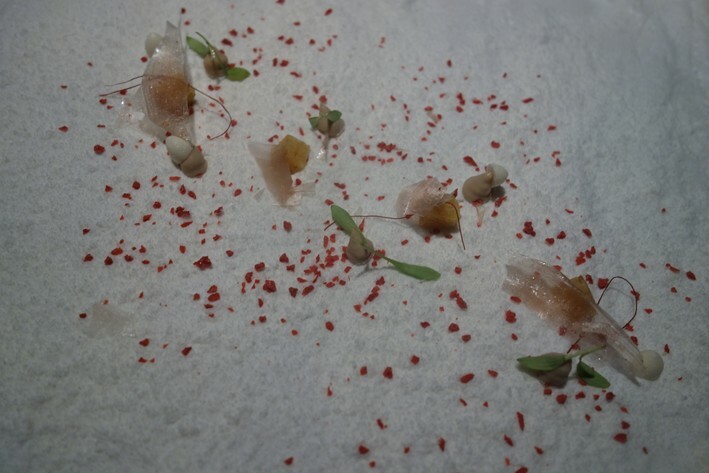 The bill came to €250 (£207) per person for the longest tasting menu with wine pairing. Service was superb throughout, the young waiters friendly and knowledgeable about the dishes. Overall I found this a very exciting meal. The cooking here bears no resemblance to the molecular culinary tricks that bedevil many modern Spanish kitchens. Yes, there are flavour combinations that sound very exotic and potentially very odd, yet somehow they hang together. Above all the dishes have tremendous flavour packed into them, the chef not afraid to use quite bold spicing at times. As ever in such a lengthy meal, there were some dishes that I liked more than others, but there were no duds at all throughout the eighteen courses. 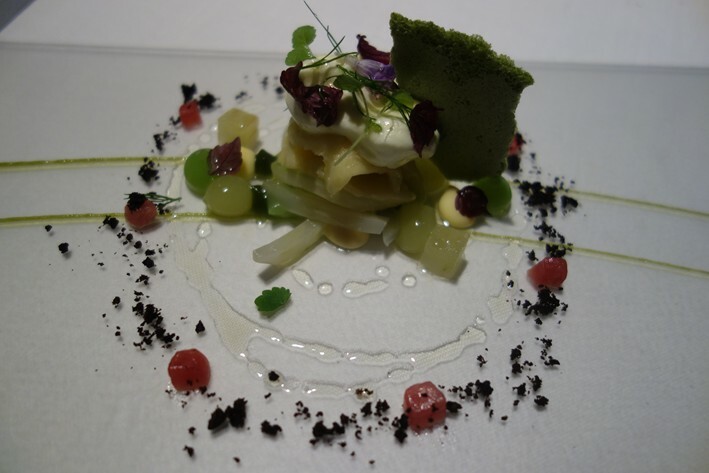 The best dishes were genuinely thrilling, and this is clearly a chef with enormous drive and talent. It thoroughly deserves its third Michelin star. Just returned from my meal here so this review is very much "hot off the press." 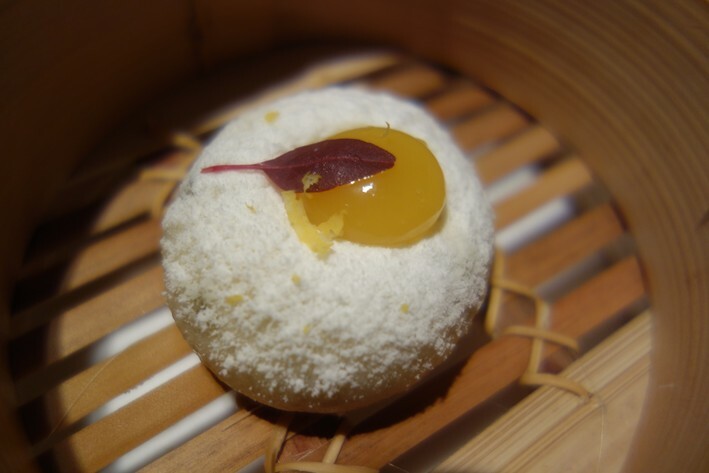 I ate with a friend of mine for lunch at a 3:20 seating, choosing the “gloton” menu which roughly equated to 15 courses. Random thoughts: 1. First word that comes to mind is “chaos.” Within the first fifteen minutes after seating we saw a water bottle being dropped by the staff on the floor and subsequently broken, a bunch of people in colored jump-suits run around, and were poured a couple glasses of champagne. Did anyone know we were here? 2. I ordered a wine pairing with my meal but had only a couple glasses come my way, then a few courses with no wine, then a nice red with my "Paris in '70” course. 3. Service was initially relaxed and picked up in efficiency as the meal went on. 4. Second word that comes to mind is “frenetic.” We had a printed menu of our meal but couldn’t even follow that! 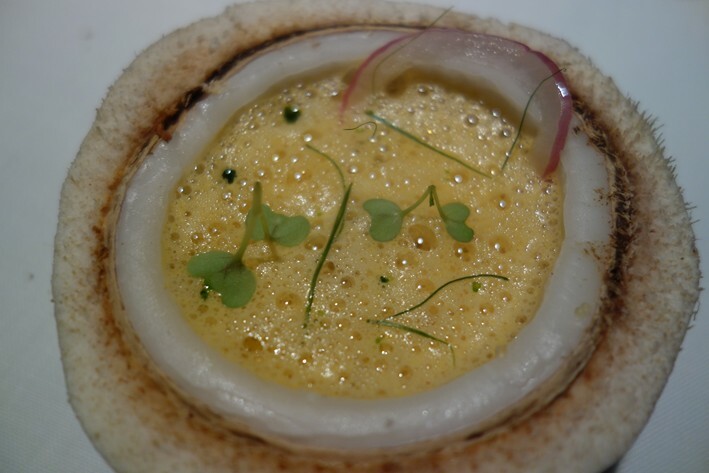 The kitchen seems to be constantly reinventing itself within a single seating… the printed courses on the menu roughly corresponded to about 50% of what I saw pass across on my plate. 5. The food was EXCELLENT Andy, I really enjoyed what was put in front of me and completely agree with your assessment that this is a 3-star experience. Superb dishes, no question. 6. Third word that comes to mind is “confusion.” Great food, friendly staff, etc. etc. but strange plastic pigs with black feathers everywhere, a bathroom with books serving as wallpaper, and faux 19th C music playing in a miniature speaker (thinking sea shells on the sand ? there is someplace near London that does this aural association with dinner…) 7. Do I regret coming here? Hell no. Great experience. 8. Price is right. 200E for a superb 3-star meal…. I’d pay again in a second. 9. Is the summary experience perhaps a bit too much for a jet-lagged mind to process on his first day in the country? Maybe. Not sure if I was in the right “mood” to maximally enjoy this but it was worth the money. I loved my meal here 2 years ago, prob one of my all time top 5. Glad you finally made it there- in my experience it was both hard to get into and hard to find. It is also worth noting that his casual place- StreetXo is supposed to be opening a batch in London soon. Good description. We had the short menu yesterday. The only thing that I would add to your post is the tremendous passion if all the staff about the food and the show. This isn't just a meal, but a Show, and enjoying it from the inside! Well, I know where I'm going when I'm next in Madrid. I was quietly optimistic about this place when I heard about it and it sounds suitably amazing.